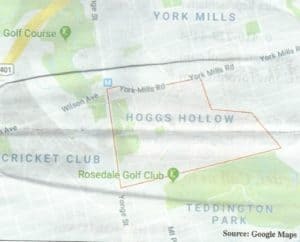 “Hogg’s Hollow, nestled southeast of the intersection of Yonge and York Mills, was originally the home of Joseph Hogg, who operated a grist mill and whiskey distillery after settling there in 1824. Nearly a hundred years later, the property was sold and subdivided into what is now a bucolic valley featuring some of Toronto’s most expensive and exclusive properties surrounded by idyllic white picket fences. While the area’s original homes were constructed between 1920 and 1960, many have been extensively renovated or demolished in favour of large, elegant custom-built homes. More recently, luxury condominium townhouses and apartment buildings occupy the edge of the neighbourhood on a leafy stretch of Yonge Street hill. 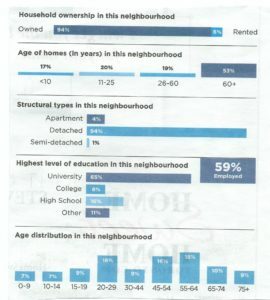 Many residents enjoy the upscale shopping and dining in nearly Yonge-Lawrence Village and a cedar-shingled Loblaws. Restaurant options also include the famously elegant Auberge du Pommier, which occupies an original 1860s cottage, and The Miller Tavern, an 1857 landmark that has been lovingly restored into an upscale tavern. “On March 17, 1960, around 6:00 p.m., a fire broke out in an underground construction site and claimed the lives of five Italian immigrant workers in Toronto, Ontario. 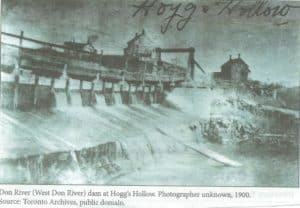 The city’s Italian community was devastated by this accident that would come to be referred to as the Hogg’s Hollow tragedy. Ontarians were in a state of shock. They could not believe that such an accident had happened here. In the aftermath of the Hogg’s Hollow tragedy the province updated its work and safety standards and created a provincial safety council to enforce them. In addition, immigrants’ working conditions improved and progressed toward employment equity. In 2000, a plaque was installed in the entrance of the York Mills subway station by the City of Toronto to commemorate this tragedy. Then, in 2010, on the 50th anniversary of this accident, a quilt representing the five Italian immigrants who died in the tunnel was hung in the York Mills subway station.